T’was the week before Christmas and all through the house, not a creature was stirring… except for the two mice in our study, furiously clicking with every available button. One small recommendation to play an early-access clicker game, Cell to Singularity – Evolution Never Ends, had quite infected the household. I’ve mentioned I like games that teach you something, so as good as I remember Cookie Clicker being, it’s Cell to Singularity that offers an interesting educational aspect (unless you count warning you of the dangers of the grannypocalypse as educational). It tracks a general picture of evolution on this planet from, as it says on the tin, cells to singularity. In fact I think I’ve learned more about the concept of the singularity from this than anything else, which probably means I need to read more sci-fi. Anyway, for those of you who aren’t familiar with clicker games, they’re entirely based around clicking the screen (or something on it). Mercifully, to give you hands a break, you can also unlock upgrades and buy producers to increase the amount you generate each click and generate stuff in the background, respectively. Cell to Singularity actually has two separate products of clicking along with a third tracked ‘currency’, so let’s address those in the most sensible way: by talking through the process of evolution. When you first open the main game screen of Cell to Singularity, you’re greeted with a primordial Earth, black and cracked with lava. Clicking it — or anywhere on the screen, for that matter — grants your first entropy. With this, you can purchase the Earth and set the ball rolling in the evolutionary process. Upgrades (which cost entropy) consist of features like the moon, an ozone layer, volcanoes and life-specific upgrades, such as protein for amino acids and nuclei for prokaryotic cells.These lifeforms are your entropy producers: DNA and amino acids through to more complex organisms like sponges, flatworms, reptiles and eventually apes and humans. 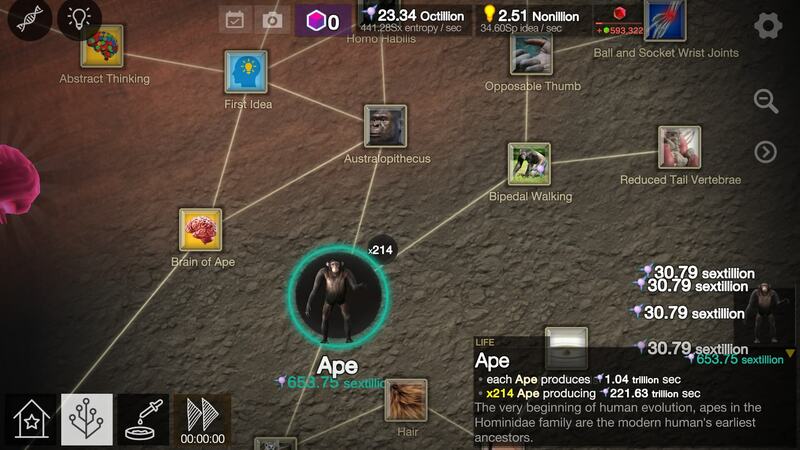 At some point, after unlocking apes, you can generate your first idea, which unlocks the second currency: ideas. These advance humanity through the ages, giving rise to producers like Iron Age, Industrial Revolution, Information Age and Android. From this point on you have two pathways to evolution operating in tandem, sometimes with one supporting the other. For those who prefer the planetary screen, the addition of Mars as a clickable object with one patch was a welcome feature, as you could then click for either ideas or entropy on the same screen. Essential for a clicker, Cell to Singularity’s user interface is clean and simple, although there’s a lot more going on than you initially expect. 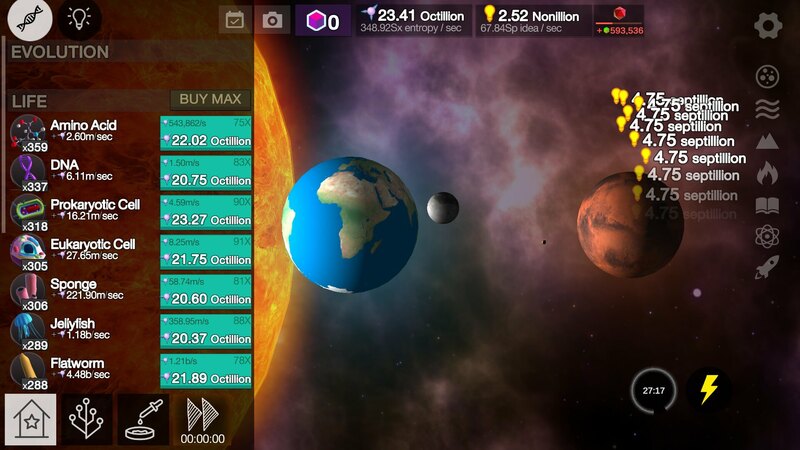 From the beginning, you have access to the home screen (showing a representation of Earth next to the Sun) and the research tree, where you can purchase producers and upgrades — all to a backing track of classical music. As soon as you unlock the primordial soup, you can navigate to that screen as well. In this view, you can switch between all the stages of life you unlock — from primordial soup for microscopic producers and a barren landscape for land-based producers to several scenes to show your scientific progress. 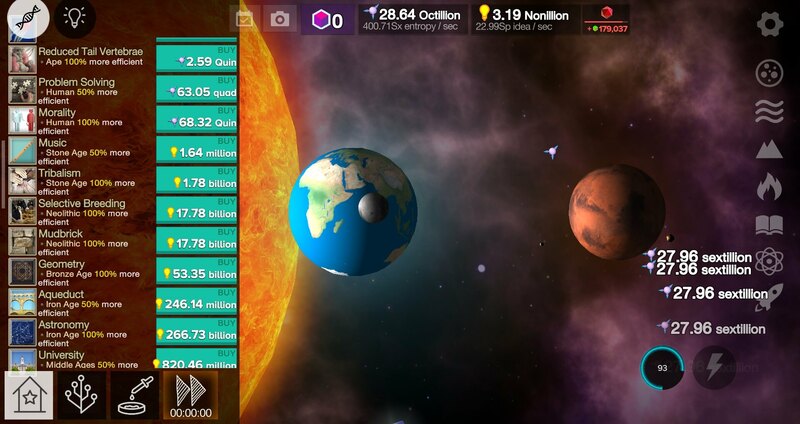 Clicking on each view generates whatever the items within it produce, although once you unlock Mars you can use the planet screen to click on Earth for entropy and Mars for ideas. 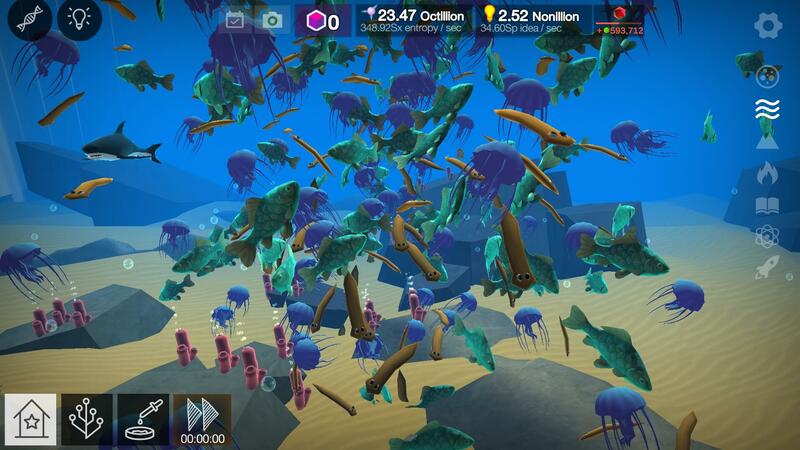 As for the other screens… well, it starts off fun and interesting, but gets pretty horrific. Every producer you buy appears in its life-stage screen and starts to roam around. If you buy a job lot at once, this can mean a hundred humans suddenly spawning in the centre and fanning out in a circle before turning an identical left turn and devolving into random motion. Freaky, huh. The Christmas shark reward hints at a more special events in the future. Being low-poly models, they aren’t great to look at, and I think it might be more interesting if they could use one model for each producer, but change their appearance as you unlock upgrades instead. For instance, the flatworm doesn’t have eyes when you first get it. It would be nice to see pigment spots appear, then eyes and other representations of progress — and, possibly, it would be a bit more visually educational this way. The thing is, as you get towards the end (or what looks like the end) of Cell to Singularity, progress starts to drag. That’s where the singularity comes in. 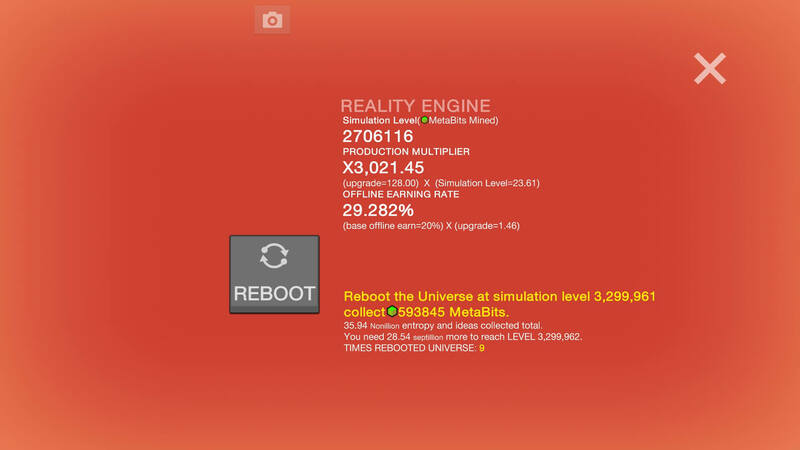 Unlocking it for the first time ‘crashes’ your simulation and forces you to start again, but it also unlocks the metabit upgrade tree. Here, you can purchase production modifiers and upgrade your simulation speed, making your next playthrough significantly faster. The more metabits you collect in each playthrough (based on how much you produce), the more your simulation levels up and the faster it goes on the next run. Repeating this cycle a few times sees you well into the Martian era. Even with a production multiplier this large, the Martian upgrade track takes a while. Reaching Mars is, however, where the game in its current state takes a downturn. Unlike many other clickers where each tier can be worth a comparable amount to the next when fully upgraded, once you’re at the Martian level, only the last two Martian producers are of any consequence… which is still not much. Martian cities produce little enough to be barely worth buying past a certain point, the upgrades are so expensive that you have to wait a week or more to afford them and even then, they don’t really make the cities worth it. We logged in after a couple of weeks (waiting for Martian upgrades) to a welcome sight: a bunch of new upgrades ready to purchase. If you want to speed things up a bit, you can buy Darwinium as an in-app purchase, which you can use either on floating boosts flying around the screen or the static speed boost. To be honest, you don’t really need them early-game and they aren’t worth much late-game. Still, it’s a little annoying the the option to activate a boost for free (which presumably displays an advert on mobiles) is greyed out on PCs for now. Normally floating boosts in games have at least one completely free version — it’s frustrating to always see them flying around but not be able to do anything with them. Thankfully, the auto-clicker is free and becomes available quite often, and at certain times you gain access to a set of daily rewards (we unlocked a shark at Christmas). At the moment, Cell to Singularity makes a great in-the-background game, good for sporadic bursts of evolution followed by a while as a nice-looking wallpaper. As time goes on, increased balance may make it a more engaging prospect for longer, but it’s a commendable delve into a fun representation of evolution on (and off) Earth. If you’re interested in giving it a go, head over to Steam to pick it up for free.